I have been waiting a good few weeks to put this post up. As many of you may have noticed I love to get busy with my hands and make things myself. This year I decided that since I didn't really know what anyone wanted for Christmas I was going to make something that they would either need or something that they like. 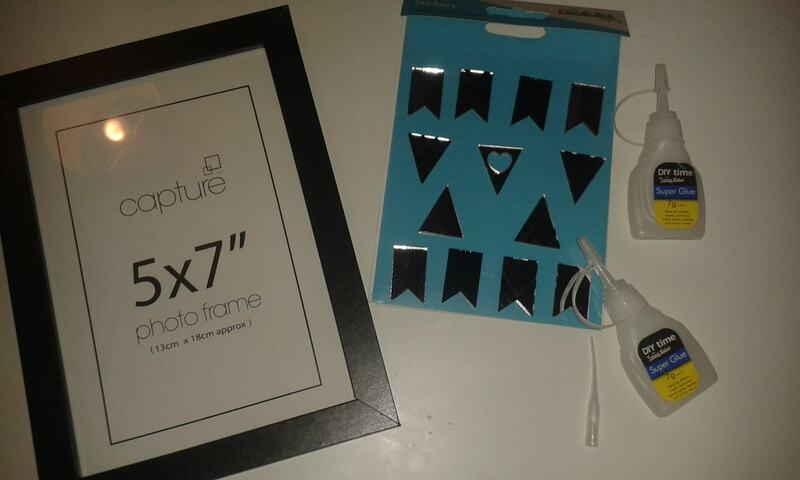 In this handmade with love post I am talking about personalised photo frames! I actually started this with the idea of making some plain white photo frames into something a bit more colourful for our hall once we finish decorating it. Once I started though I just couldn't stop and I loved how pretty they looked and suddenly every time we went to a shop I was saying 'that will look lovely on a frame!'. 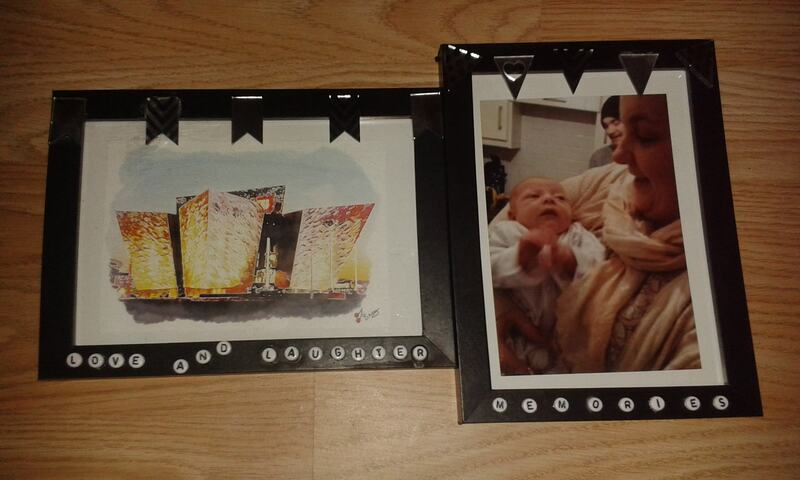 I then decided my mum and sisters and brothers would all love them and so came the Christmas gifts of photo frames. A few people already know which ones they are getting and my mum knows almost all of them but nobody has actually seen them yet so I do hope everyone loves them as much as I have loved making them! Fingers crossed. If you would like to make these you can follow along with each frames journey to completion. First up we have the frame which took the longest to finish and was defiantly the most difficult. 'The blinged out frame' to make this one I used a black and a white 5" x 7 " frame which I got in a pack of 3 in B and M bargains for £2.99. I also used super glue ( PVA would be fine I think. 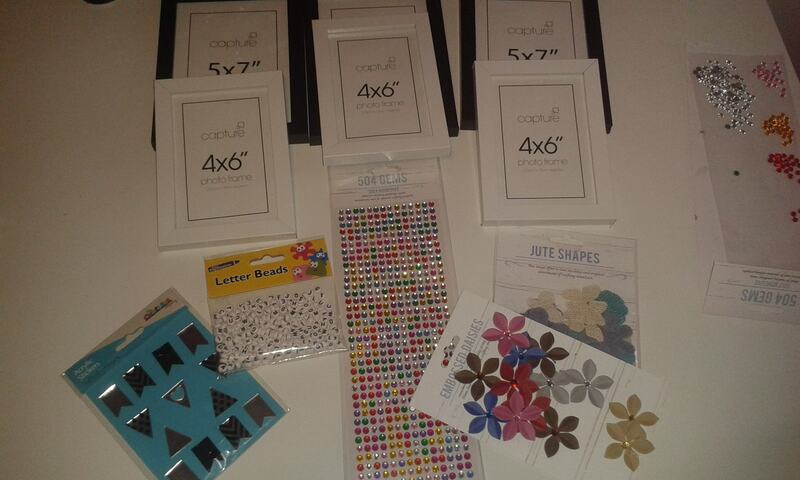 Mine need to last through a Royal Mail posting!) and finally 2 packs of gem stones which I got in Poundland. First I needed to remove each gem stone from the glue backing it was attached to. You can get them already undone online but I just wanted to be awkward. (Not really!) I was not aware of this when I started. 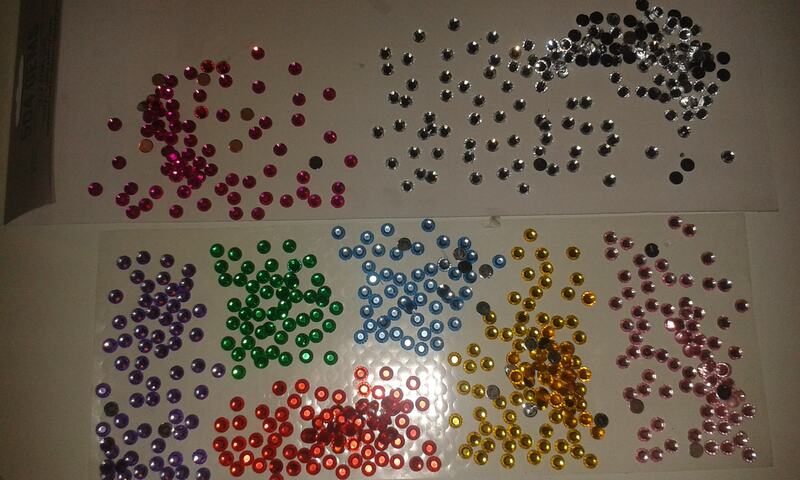 You can however just add the gem stones with the glue strips they are attached to if you like. Once I had separated all of the gem stones into colours I got to work on deciding in what order the colours would go and how many colours I would actually use from the pack. Next I got to work using the super glue to stick down each gem stone individually onto the frame in as straight a line as I possibly could. Once you have the first line down your pretty much good to go! Just keep going and going and going. Yes I am being serious. One of these frames probably took me around 17-20 hours altogether if not more. I did say it was time consuming. The finished results are below and I must say I do love these! All the other frames are much easier and faster to make.The next frame up is the flowers and butterfly frame. I loved this frame so much that I made myself one when I had finished. This actually took about 25 minutes to make from start to finish. If you would like to make this frame you need some Jute Shapes which I got in Poundland again, superglue and another white frame in 5" x 7". This is super simple! To complete the frame arrange the jute shapes in the way you like. Don't stick anything down before you are happy with the position of them all. Once you are happy use a generous amount of glue and stick each shape to the frame and finish off any flower with a gem stone. Voila you are finished! After those I got to making the worded frames with bunting. For these I used a pack of lettered beads, a pack of mirrored bunting shapes which are acrylic, superglue and another 2 black 5" x 7" frames. These where even easier than the last ones and after I had decided what to do I think these took me around 15 minutes to do both. I first added some glue to the acrylic pieces before sticking them on the top of the frames in a sort of bunting line. 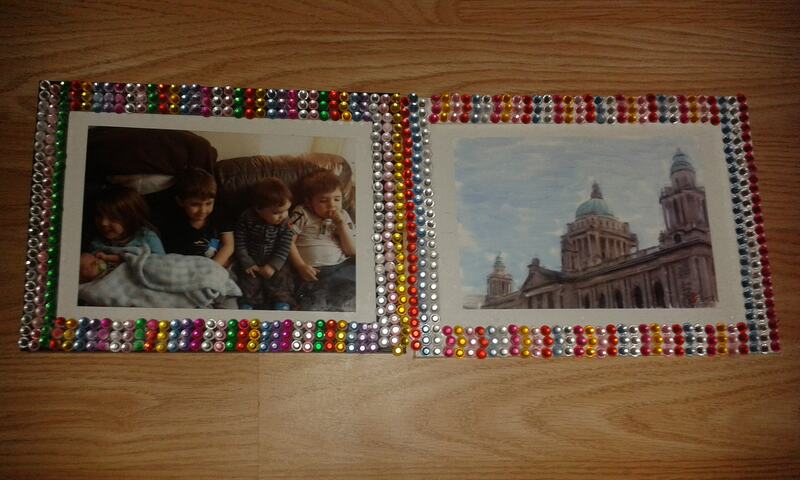 Finally I added the lettered beads onto the frame to make words. I wrote 'Love and Laughter' and 'Memories' on mine. Here they are! 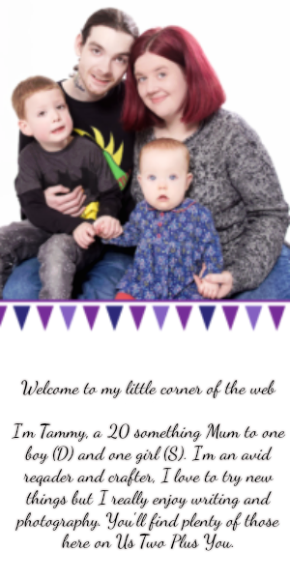 As a little quick project I made this lovely purple glitter frame using some washi tape I found on eBay for around 60p. This was so simple to make I simply added the washi tape around the front edges in strips of tape and then the same in one long strip around the outer edge of the whole frame. I completed the tape ends with a bit of extra PVA glue and was finished. I like how this one sparkles in the light and has a great professional finish. 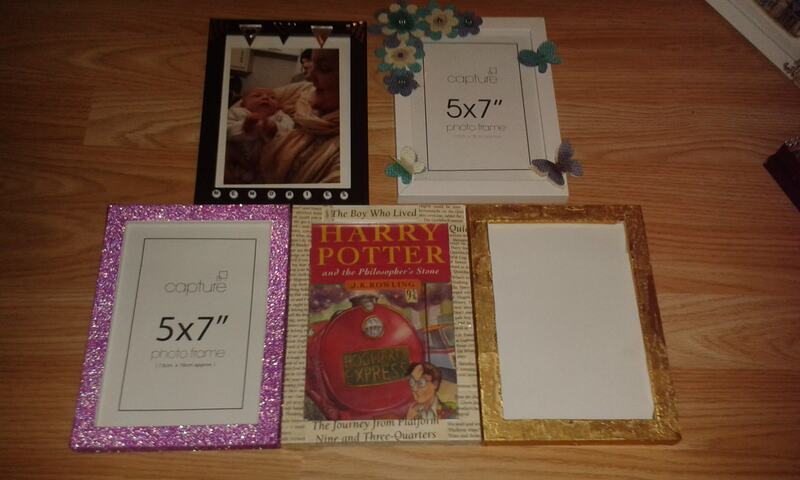 Last but certainly not least is the Harry Potter frame and the golden moment frame. 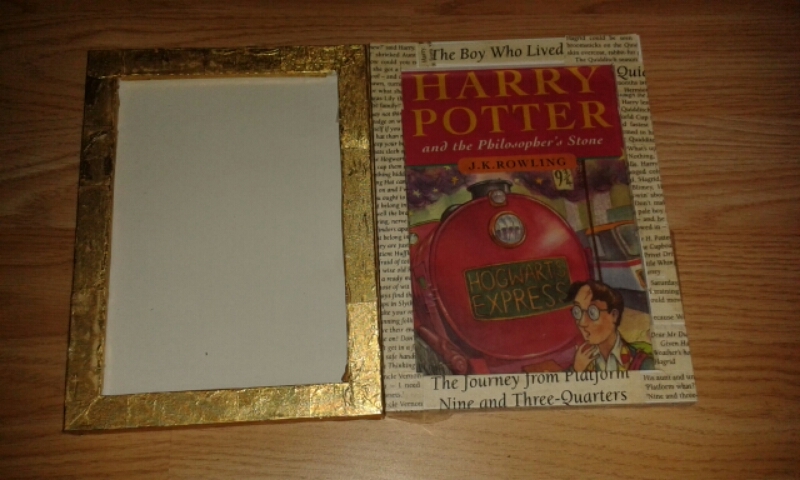 The Harry Potter one was made using a book I picked up in the charity shop. It wasn't in great shape in general however I only needed a few pages to make this beautiful frame so I set to work. Firstly I started with the book, a paintbrush, PVA glue and a white 5" x 7" frame. After I had everything I needed I selected a few quotes or obvious parts of the book to use on the frame. I cut them all up into smaller pieces so I could stick them where ever I liked. I also used chapter titles on the frame for the big print and recognisable words/ phrases from the book. Once I had all my quotes I took the PVA glue and used the paintbrush to apply the glue to the books page pieces and started to stick all the bits down where I wanted them to be. It didn't take long to fully cover the frame. I then allowed this to dry before adding another layer of PVA glue to the frame to help stick down the paper which was quite thick. This one can be messy! I used the same technique to do the 'Golden Moments' frame which in actual fact is a frame covered in Ferraro Rocher Golden wrappers from a box I got as a gift. I love those little wrappers as they are so small and quaint. I thought they would look nice and shiny. I added the glue to the wrapper and stuck to the frame for this lovely look. once both frames had dried I cut off any excess paper that had was just hanging down. . Now you have it. Lots of handmade Christmas gifts of personalised items from me. 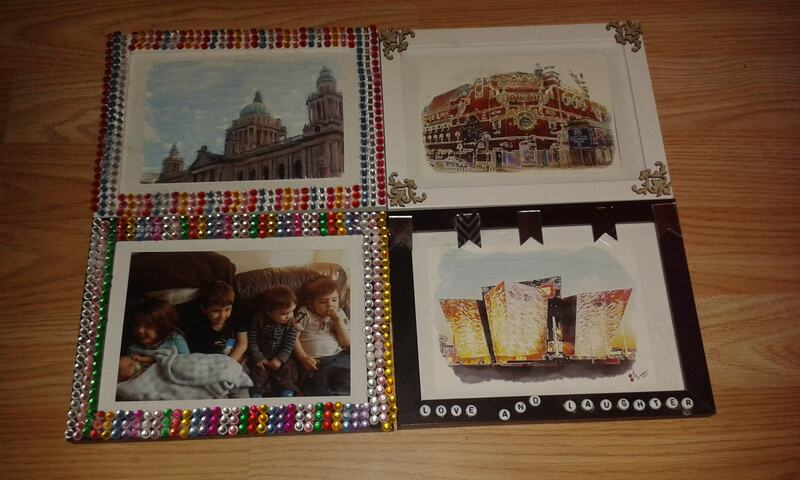 Here they are together after I added pictures to most of the frames.